What’s It Like to Be 4 Months Old? Babies begin learning during the very first minutes of their lives. By age 3, about 85 percent of the brain is wired. This wiring affects how your baby sees, talks, hears, moves, and interacts with others. 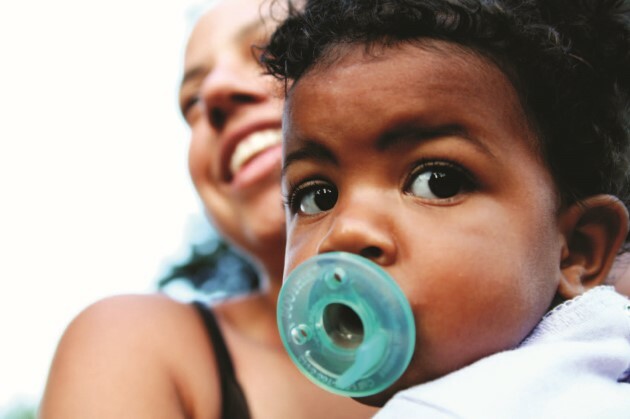 Babies need a warm and loving environment to develop the brain connections that will help them learn throughout their lives. Physical, cognitive, language, social, and emotional development are all linked together. Everything in the brain and the body is connected. Babies are learning to talk, to work their bodies, and to form strong bonds with caring adults. Everything works together to build their brains. The way people treat your baby affects how her brain develops. When babies live in a safe loving home, they reach out, explore, and learn. When you spend time enjoying and playing together, your baby learns how to love and relate to others. Parents are the best and first teachers that babies have. I turn my head in all directions. I lift my head forward when I’m on my back and grab my feet with my hands. I sit up with my head and back straight if you support my body. I prefer sitting, instead of lying down. It’s more interesting! I roll from side to side, and I might even be able to roll from my tummy to my back. Watch out! I could quickly roll off a counter, changing table, or bed. My reaching and grasping skills are getting better. At first, I had to look from my hand to the toy. As I get better, I grab for the toy without looking at my hands first. I try to move a toy from one hand to the other. I put things in my mouth. I splash and kick with my hands and feet while getting a bath. I babble and imitate sounds, such as coughing and clicking my tongue. Make the same sounds back to me. I coo, grin, or squeal with joy when you talk to me. I love to see myself in the mirror. I’m fascinated by my hands. I like some people and am shy or scared of others. I remember important people, such as Mom and Dad, from night to morning or even longer. I may have one favorite toy or blanket. My hands are so cool! I really like looking at them. I can remember where an object was hidden for a few seconds. I’m starting to learn that things go together. When I hear the water running, I look forward to splashing in my bathtub. I know if something is near or far. I’m more aware of depth and distance. I get excited when I have fun. Everything is a game to me. I may cry and get mad when you stop paying attention to me or take a toy away. I love it when you play music and dance with me. When you hug, kiss, and hold me, I feel loved. Put me on my tummy and hold up a toy for me to follow. This helps me learn to roll over. Blow soap bubbles for me to follow with my eyes, but don’t let the bubbles get in my eyes! Read nursery rhymes to me. I like to listen to your voice. I like looking at myself in the mirror. Give me a kiss while both of us are looking in the mirror. Move me close to the mirror, then away. Let me touch the mirror. Play”This little piggy” with my toes or fingers. If I seem strong enough, encourage me to get on my hands and knees and rock my body. Show me what to do. Set me on the floor hold me up. Let me try to sit alone alone and balance myself. Place toys out of my reach and ask me to get them. Watch me roll or scoot! A baby’s first teeth often come in at about 6 months of age, but some babies get them as early as 3 months of age. Some babies won’t get any teeth until after a year. The age doesn’t matter. Once she starts, your baby will teethe off and on for months. Your baby will want to chew on everything. She will probably drool more than usual and may be fussy and cranky. As teeth push through the gums, your baby will feel some soreness. Chill a clean teething ring in the refrigerator, then give it to your baby to chew on. If your baby has a fever, vomiting, diarrhea, or other signs of illness while teething, call your doctor. Begin brushing their baby’s teeth with a little water as soon as the first tooth appears. Not use toothpaste until their baby is at least 2 years old. Get a well-baby dental checkup by their baby’s first birthday. It’s easy to ignore the first signs of stress. But if you tune into your body and your feelings, you can learn to read the warning signals and take action to reduce tension. Put your baby down for a nap and forget about the things you think you should be doing. Use this time to rest and relax. Set realistic goals and prioritize. Trying to do everything, plus taking care of your baby, will wear you out. Pick the most important things and don’t worry about the rest. Eat healthy foods, including veggies, fruits, and whole grains. Your sleep is as important as your baby’s sleep. You need enough sleep to stay healthy. Plan time for yourself. Ask a friend to watch your baby while you exercise or do whatever makes you feel fresh again — energized and relaxed. When you feel worried or angry, don’t bottle it up. Talk to a trusted friend. If your feelings seem to be getting out of control, or if tension is so high that your partner reacts by harming you, there is help available. Call 800-799-SAFE (7233), the National Domestic Abuse Hotline. The Consumer Product Safety Commission recommends that babies NOT use a walker. They can be very dangerous. Many infants arrive in emergency rooms after baby walker accidents. These injuries are usually serious, including skull fractures and other head injuries. Many of the injuries are caused by infants falling down stairs in a walker. The stairs either do not have gates on them or the gates are left open. Not only are they unsafe, baby walkers generally do not help babies learn to walk. Some experts think that baby walkers do more harm than good for leg muscle development in most babies. Strollers, on the other hand, can be useful. Never leave the stroller in the driveway or behind a car. Your baby can wiggle out of an infant seat, out of the bathtub, off the changing table, and off the bed. Next time your baby is playing with something, watch to see if she looks for it when it is taken away. Probably not. At this age, if she can’t see it, she doesn’t remember that it exists. For your baby, out of sight is out of mind. When your baby has a toy you want to take away from her, give her another toy before taking away the first one. Put it out of her sight. This is an easy way to redirect her attention. At this checkup, your baby will get a set of immunizations. The second set of polio, HIB, and DTP immunizations will be given. Remind your doctor of any reaction your baby may have had to the first set of immunizations. Take a list of questions you want to ask your doctor or health care provider. Keep a record of your baby’s immunizations. Use a health journal, a notebook, or form that you are given. You will be asked about your child’s immunizations many times, including when he goes to school. Make it easy on yourself by keeping this information in a handy place. Immunizations protect your child’s health. Immunizations are available through your doctor, health care provider, or public health office. Children can strangle in the cords of window blinds or draperies. Keep them out of your baby’s reach. Your baby can reach and grab. He can grab your coffee cup or stick his hand in your soup. Hot liquids can badly burn him. Keep your baby away from hot liquids and foods. Never leave your baby alone in the house or a car, or anywhere for that matter. If you do need to leave your baby alone for a few minutes, put him in a crib or playpen. Researchers have found that when a parent responds to a baby’s cries more quickly at age 4 months, the baby cries less and calms easier by the time he is 8 months old. This surprises many people. They think responding quickly to a cry will spoil the baby. But babies aren’t like that. Babies cry when they need you because they are upset, sick, or uncomfortable—not to cause trouble. A quick response teaches your baby to trust you. Your baby learns to give a small cry instead of a big one, because he knows you will come to help. When your baby is getting the help he needs, he needs to cry less. Ignoring your baby’s needs may teach him that the world is not to be trusted. Learning trust gives us the courage to deal with the world around us. Your baby needs to learn to trust so he can grow into a caring and responsible person. Purpose of the game: To teach your baby to use his body and lift his head and part of his upper body when watching a moving object. How to play: Put your baby on his stomach and sit facing him. Use a ring of keys or a toy that makes noises. Dangle the noise-making object in front of your baby’s face and say,”Look at the keys:’Raise the object slowly in the air to encourage him to lift his head and push up with his hands. Say something such as, “Follow the keys” or “Keep your eyes on the keys”Watch your baby and see if he can lift his chest off the floor. Move objects slowly behind your baby’s head. See if she will move around to find the object. Encourage your baby to use both eyes and both sides of her body when she is playing. For example, if you give her a toy for her right hand, try giving it to her in her left hand the next time. Dads make a difference! They love, guide, teach, and nurture their babies. Some fathers are the main caretakers for their children. How much should fathers be involved with their babies? As much as they can! Studies show that when dads play with their babies, it helps babies feel important. It also helps them later on in elementary school. These same children get along better with their classmates because of their dad’s involvement. Fathers play an important role in helping give children a kick start to fitness. Dads and moms both can be good role models for exercising and keeping their bodies in good shape. You can help set the foundation for healthy weight by helping your baby learn to eat the right amount (just the amount your baby wants) of healthy foods and learn to enjoy moving his body and keeping active. Don’t force your baby to eat more than she wants. She will let you know when she has had enough. Fat babies are not healthy babies. Researchers believe that babies who gain too much weight in their early months may have more problems with their weight as they grow older. If you think your baby is gaining too much or not enough weight, talk to your doctor. Pay attention to your baby’s cues. She will know when she has had just the right amount. Never put your baby on a diet! Many doctors recommend that babies do not start eating cereals or other solid foods until they are 6 months of age. Solid foods don’t have as much nutrition as breast milk or formula. They are harder to digest and may upset your baby’s tummy. Eating solid foods too early may also cause food allergies. Other reasons to avoid solid food are that your baby can’t fully control her mouth and tongue yet. Also, she may not have control over her head and neck. Semi-liquid and solid foods should not be given to your baby before she can sit up with support and has head and neck control. Check with your doctor or nurse before starting solid foods. For now, breast milk is the best food for your baby, or the fortified formula your doctor recommends. Babies don’t usually need extra water. They get all they need in breast milk or formula. Can your baby obey you? It’s important for a child to obey her parents, but a 4- to 5-month-old does not understand what you say to her. She hears your tone of voice and may sense that you are angry. Research shows that a baby this young is not able to control her actions long enough to do what you tell her. And your baby won’t be able to obey for some time. Spanking or slapping her hand will only confuse her and won’t help. Being kind and gentle with your baby will help more than anything else. Your baby doesn’t do things on purpose yet, and she surely doesn’t do things to bother you. Old lead paint in homes built before 1978 can break down into dust. The lead dust clings to toys, fingers, and other things that children put into their mouths. Lead poisoning can occur when lead dust is the size of three grains of sugar and gets into your child every day for just 30 days. If your home was built before 1978, use soap and water to clean up lead dust with a mop or sponge. Use that mop or sponge only for lead cleaning. Do not allow anyone who is pregnant to clean up lead dust. Clean your baby’s hands, toys, and your home often. Wash your baby’s hands before and after eating and sleeping. Every day: Wash pacifiers, chew toys, and other items that your baby puts in his mouth. Lay your baby on his back on a blanket or rug. Place your hands under his arms. Slowly pull your baby up until he is sitting. To encourage him, say things such as,”Up we go!” At first, you may do more of the work.Your baby will get the idea and may soon work hard to help himself up. Lay your baby on his back on a blanket and sit behind his head, holding a noisy or squeaky toy. Hold the toy where your baby can see it. Slowly move it so he has to turn his head to follow it. gently push on his bottom to help him over. Save this game for later if your baby doesn’t try. To help your baby feel what it’s like to roll over, lay him on one side of a small blanket. Gently raise the blanket to help him roll over. Reward him with big smiles and hugs.